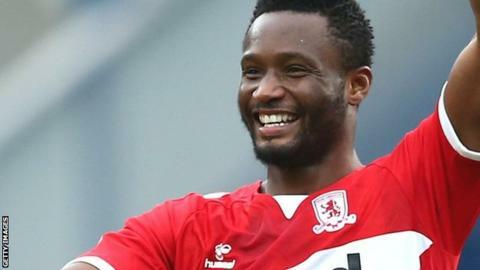 Champions League winner John Mikel Obi says promotion to the Premier League with Middlesbrough would rank as one of his finest moments in football. The 31-year-old midfielder collected two Premier League titles, a Champions League, Europa League and three FA Cup winners medals with Chelsea, and joined Boro on a short-term deal in January. "If we manage to pull it [promotion] off, it would be amazing," he said. "It would be up there as one of my greatest achievements." Mikel moved to the Riverside Stadium as a free agent after a lucrative stint in China with Tianjin Teda. Boro have lost just once in the league since his arrival and are fifth in the Championship with 12 games remaining. A drop into England's second tier was something new for the Nigeria international, who captained his country at the 2018 World Cup and won the Africa Cup of Nations with the Super Eagles in 2013. "I'm still hungry and want to win trophies. I'm never satisfied with what I have achieved. If I was, I would just sit at home," he told BBC Sport. "I want to achieve something with this club and that is to get this club promoted. "I love challenges and I knew coming in here would be a challenge for me, and being in the second division would be a challenge for me. "I knew this club would be pushing for promotion and managing to do that wouldn't be easy." With a game in hand on all four sides above them, Boro are nine points adrift of the top two and an automatic promotion spot. After 34 games they have the best defensive record in the division, however, they have laboured at the other end and scored the fewest goals of any side in the top 15. "Middlesbrough are a massive club and should be in the Premier League - it is where it belongs for me," he said. "We still have a lot of games to play, and if we manage to win quite a few of them, who knows? "If we could get automatic promotion, fine, and if we get into the play-offs and that is how we do it, then that would be amazing as well. "We just have to keep pushing." As for his own future beyond his short-term deal until the end of the season, Mikel was coy despite saying he felt "at home" and was "enjoying" his time on Teesside. "I want to enjoy my football and enjoy winning games with this club, these players are an amazing group of guys," he said. "Every time we win a game you see that feeling of wanting to be in the Premier League and that is something I want to keep enjoying with them until the end of the season. And then we see where we are." Mikel's midfielder partner Muhamed Besic says the Nigerian has added "confidence" to the side with his mentality, composure and talent which saw him thrive among the world's elite for more than a decade. "It is a big thing that he came to the club," said Besic, who is on loan at Middlesbrough from Everton. "Now we have a really strong core and with Mikel coming in, he is an experienced player who has played a lot of big games in his career."